One of the challenges about playing card games is finding enough players to play a game according to the rules. In traditional Euchre, you need four players. Luckily though, if you are short on players there is a variation for two players. Players compete to win the most tricks, just like in the four-handed version. Unlike that version, players compete individually instead of as partners. Remove the cards ranked two through eight from a standard deck of 52 playing cards. Those cards are not used in Euchre. Deal 12 cards to each player. The first four are dealt face down to each player. His next four are dealt face up, one each on top of the face down cards, and these eight cards remain on the table. The final four cards are dealt face down and he holds them in his hands. Select the trump suit. The player that is not the dealer has the first option to choose. He can choose a suit or pass. If he passes, the dealer must choose the trump suit. The trump suit is a suit that can defeat any card from another suit, but it can only be played if it is lead to start a trick, or the player playing it does not have a card in the suit that was lead. Play 12 tricks to complete the hand. The person that did not deal leads the card for the first trick. Each trick after that is started by the player that won the previous trick. A trick is won by the highest card in the suit that was led, or the highest card in the trump suit. 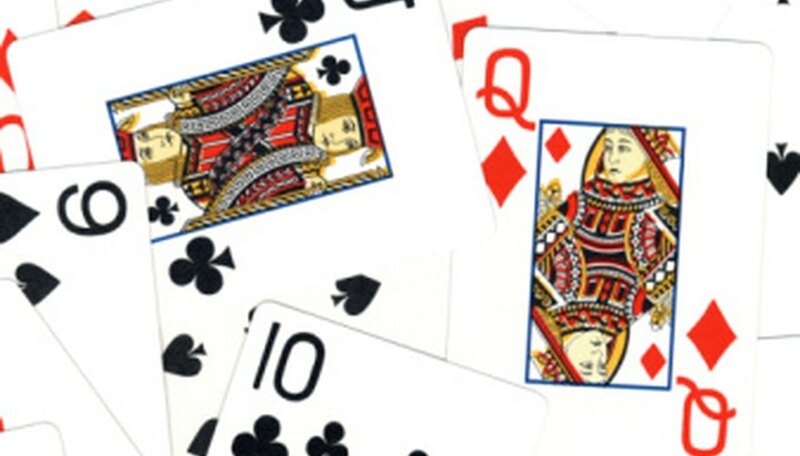 Any of the face-up cards on the table or the cards in a player's hand may be played to the trick. Flip over any face down cards uncovered on the previous trick. After each trick, a player must flip any face-down cards that were exposed by playing the card above it. That face-down card is now one of his face-up cards and eligible for play. Score the hand. If the player that chose the trump suit fails to win at least seven tricks, her opponent gets 12 points and she gets zero for that round. Otherwise, each player gets one point for each trick she wins. Shuffle the cards, with the non-dealer for the last hand becoming the dealer for the new hand. The game continues until one player has a total of 31 points or more at the end of a hand, making him the winner. If both players exceed 31, the one with the most points wins. You can play a version with fewer tricks in each round. Deal nine cards, with three face down, three face up and three in each player's hand. This results in just nine tricks and nine points in each deal. The player that declares trump must win five tricks or her opponent scores all nine points for the hand. If a player fails to follow suit of the card led, and it is later discovered that he could have, his opponent is awarded all the points for that round.